Get up to 30,000 €, co-create and test your digital health solution with a healthcare organisation and receive personalized business support. Apply before 8th June 2018! inDemand is a new model where Healthcare organizations and companies co-create Digital Health solutions, with the economic support of public regional funds. Why is this model innovative? inDemand applies at the same time demand-driven and co-creation approaches. This EU project is currently being developing in three pilot regions: Murcia (Spain), Paris (France) and Oulu (Finland). "These challenges have been detected by healthcare professionals from Foch Hospital. Such a great example of the commitment to innovation of this hospital, showing also that healthcare professionals are interested in co-creation. Now it’s time for companies!”, explains Jorge González, coordinator of inDemand. European companies interested in inDemand Paris Region call should apply before 8th June 2018. 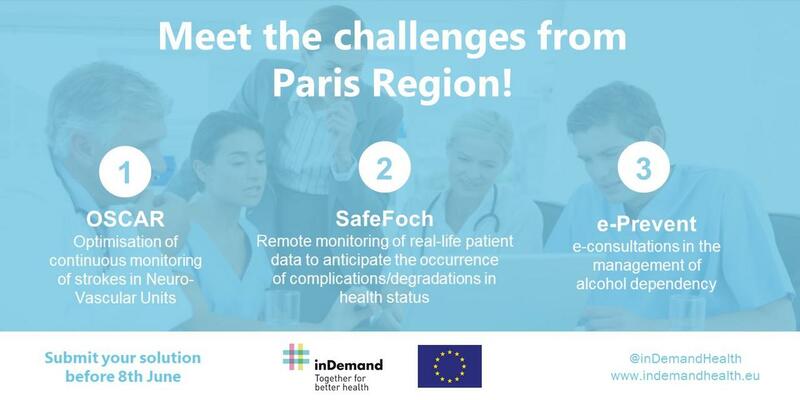 The three challenges have been detected by Foch Hospital and RESAH. The competitive call has been launched by the funding organisation, Paris Region Enterprises. Companies may also be interested in challenges from Murcia and Oulu Region. Find all the information on the project website www.indemandhealth.eu. “inDemand solves challenges identified by the customer -the Healthcare organizations-. That’s why we talk about a demand-driven model. This approach is going to increase the capacity of health entities to systematically identify and solve their needs while creating opportunities for private companies”, clarify Jorge González.